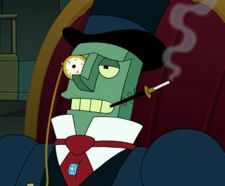 Billionaire Bot is a robot whose image is a stereotypical snooty billionaire. He first appears as a member of the Ultimate Robot Fighting League, opposing Bender the Offender in a fight. It is later revealed that he is one of the primary members of the super secret, supposedly non-existent League of Robots. He is also completely blind after a horrible banking accident. He has to resort to popping out human eyes and making monocles out of them. He also has children of his own. Another character who wears a monocle is the Slurm master. This page was last edited on 8 December 2013, at 01:11.